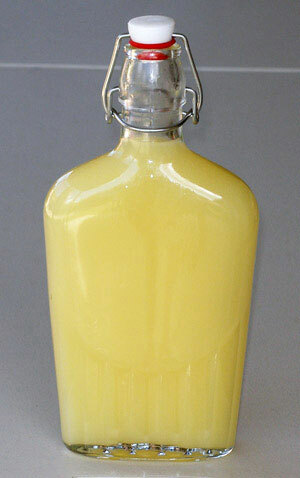 Limoncello (sometimes called Lemoncello) is a lemon liqueur very popular in Italy. Nowadays, it is becoming more popular in other countries. There are a lot of bottles of limoncello commercially sold all over the country, but why buy a bottle when you can make your own homemade limoncello lemon liqueur. Note: Everclear is 190 proof (95% alcohol) and in some states of the U.S. a 151 proof (75.5% alcohol) is sold instead. 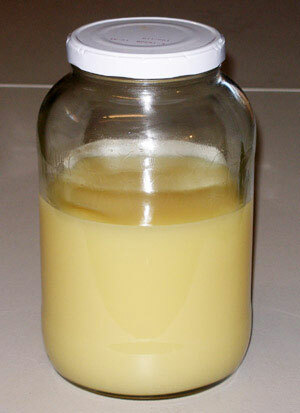 The 190 or 151 proof is fine to make limoncello. If you can not find grain alcohol in your region, use 100 proof vodka. Wash all the lemons using a brush and warm water to remove all the pesticides and dirt. After washing the lemons, dry them with a paper towel. Note: Peeling the lemons and removing the pith could be time consuming, but with some experience, the process gets easier and faster. Trust me! 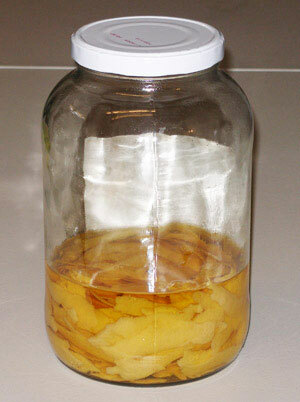 Place all the lemon peels in a glass jar and add the liter of grain alcohol. Let the peels and grain alcohol age for at least a month. I usually leave it for 6 weeks. Stir it once a week with a metal or wood spoon. Don't throw away the empty bottle of Everclear. You are going to use it to store the limoncello once it's ready. Note: Within the first day of aging, the grain alcohol is going start turning yellow. After a month of aging, the liqueur is ready to be strained. 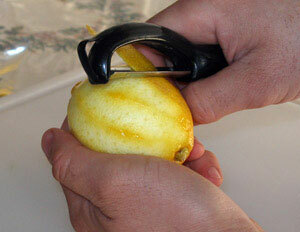 Strain the liqueur with a strainer to remove all the lemon peels. Then filter it with a coffee filter to remove any small particles like pieces of pith. Note: Notice how the alcohol turned to a dark yellow (more like an orange color) after a month of aging. 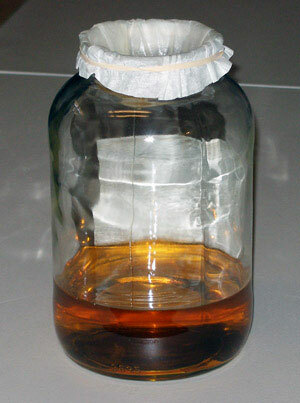 Make a simple syrup by boiling the water and adding the sugar. Stir constantly until all the sugar dissolves completely. Let the syrup cool down. Add the simple syrup to the filtered liqueur. Note: As soon as you add the simple syrup to the liqueur, it is going to change color. It will go from a clear orange color to a bright cloudy yellow. Get two empty and clean 1 liter bottles. Use a funnel to pour all the limoncello into the bottles. After bottling the limoncello, store one bottle in a cool place and store the other one in the freezer. If you have room in your freezer, place both bottles of limoncello in there. Don't worry, the limoncello is not going to freeze. 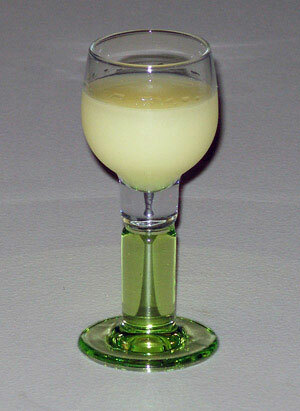 Limoncello is served chilled as an after dinner drink. It's usually served in a small glass like a cordial glass. The glass is usually chilled as well.